Children love music and singing. There is something magical about words being set to a melody that make children perk up and join in. Since most children’s songs consist of catchy beats and poetry-infused lyrics, it is a perfect combination of rhythm, rhyme and fun. An added benefit to children’s songs is that they are often easy to learn. The short, repetitive sentences lend themselves to easy memorization and retention. What better way to learn words in context than to sing them out loud? Children don’t even realize how much their language skills are improving while joining in the singing fun. Bilingual children, in particular, can benefit from singing songs in their second language. Even if most of the words are unfamiliar at first, mimicking the words in a song can help children practice producing sounds in the new language. Eventually the sounds give way to actual understanding as the song is practiced over and over again. It is a win-win situation all around. Repetition: Pick songs that repeat words and sentences over and over again. Focus on these repetitive parts first with your students. Once your students start to memorize these, they will be more eager to participate and will be excited to learn the rest of the song. Encourage children to try and join in even if only now and then – they may have picked up a word here or there and will want to call it out when the song reaches that point. 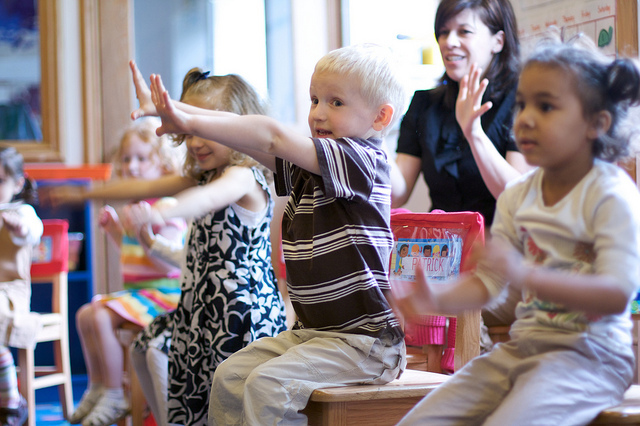 Movement: Children delight in songs that include movement. Being able to move our bodies while practicing words and sentences in another language can have a tremendous impact. A favorite movement song for children is the “Hokey-Pokey,”but also see if you can find movement songs that come from a variety of cultures . Another idea is to have your students choreograph their own movements to a song. Choose a song that has a lot of movement words and let your students choose how to illustrate these with their own bodies. Lyrics: It goes without saying that the words of the song are key when it comes to bilingual children. If there are too many new, difficult words, then the experience can backfire. Singing songs together should be fun and inspiring, not burdensome and frustrating. However, you will also want to help your students expand their language skills each time they learn a new song. Go over some of the words, or even all of the words, ahead of time. Make sure your students understand what they are singing – it makes for a more meaningful activity. Also try to pick songs that have full sentences which students may use in their everyday lives. Rhyming: Songs that rhyme can help students memorize vocabulary more easily. Pick songs that have rhyming words that match what you are working on with your students. For example, if you are working on words that have the long-o sound, then choose a song that has at least a good number of rhyming words with the long-o sound. It is a fun way to help students understand the different sounds in words. Another tip is to let students come up with their own songs! Together as a class (or in smaller groups) they can choose the rhythm and then come up with words and sentences to go with it. Or you can give students a list of words that you are working on in class to see if they can put them together into rhyming lyrics to go with music. Languages: There is no reason to only stick to songs in English! Give students the chance to share songs from their own traditions as well. Work with students to give them opportunities to teach the class simple songs that everyone can learn and enjoy. This can be a very empowering experience for your students and it shows them that songs from all cultures and in all languages are special and important. Tell your students’ parents that you are working on this – they may even offer to come to your class to teach some songs. These are 6 different tips for how you can include music and songs in your bilingual classroom. You will be amazed at how quickly your students pick up words and sentences when they are added to music. Giving students the chance to make their own songs can be very empowering. By putting together their own sentences that have personal meanings, your students will more easily remember the words and sentences for many months to come. Plus, it is just so much all-around fun! If you are looking for board books that are based on simple songs, you may want to look at Head, Shoulders, Knees and Toes, The Wheels on the Bus and Row, Row, Row Your Boat. Also, Ana Lomba offers books in Spanish, French and Chinese which contain numerous fun songs and activities to support language learning. What are your experiences with introducing music into the bilingual classroom? How have your students responded to this experience? Previous PostHow to Help Students Survive Culture ShockNext Post$300 Bilingual Book Giveaway! I love to use music in my classroom with my ELL students. I used it to teach them color words and sight words. They love it! That’s how I teach English as a second language for very young learners in Hungary. Using songs, rhymes, and play. It really works!!! It’s amazing how quickly kids can adapt to the new language with the help of songs. I wish all the kids had the opportunity to learn languages in this way at an early age. It sounds great! Are you from Pécs? You are very welcome to engage with the projects. Agree that music is a great tool for learning. Any great site recommendations for popular nursery songs in Spanish and French to teach my son? I use music with my children to teach them Spanish and English. We have some CDs in Spanish and also books like Wheels On the Bus. Thanks for the great ideas! I could not agree more with this article I have seen what music can do to improve language skills will all children. I also have to add that when you include hand and body motions to do go with the songs it adds just that little bit of extra effort to connect the words the children are saying to the motions and body parts they are controlling. One suggestion, and I have used in class before, is “Frere Jacques” because it can be done in so many translations it is unbelievable and the words are simple and meaningful. Our Chinese language teacher often introduces songs during class and offer suggestions on music CD’s to play at home. I’m amazed three years later, the kids can still remember and sing “Dà xiàng” (Little Elephant) and Jackie Chan’s Mulan song; complete with hand gestures! I’m not a teacher, but I sponsor children in Ecuador through Compassion International. I went on a sponsor tour last year and met them. The little girl said that she wants to learn English, so I’ve been sending bilingual books to her. while there, she sang a song to me, and I sang one to her. I know she loves music, so after reading this, I think I may try a recordable greeting card! wish I could send a cd, but alas, I can’t. I loved this article. It gave me so many ideas on how to use music in both my classes and with my own children. I need to find more music for children in German. It has been tough to find music for them. Wow! Great help and research. I have observed the results of using music to engage my students and children… but the far-reaching and sticking power of music is such a great bridge to teaching anything! This is so true and all the reasons behind it make it even more compelling to use music again and again. I appreciated for the article, which I found very favourable for my academic writing, I teach English by myself to preschool age children and I use this form of learning very often. This is the easiest way of acquiring language skills. I would like to know the name of the author of this article if possible, thank you. do u guys think dat the government will approve if we put up a propsal of combining music with education ? can u all help me with my proposal. I constantly spent my hlf an hour tto read this blog’s articles orr reviews daily along with a cup of coffee. Great post. I am going through many off these issues as well..
Music help child learning language…that’s amazing. I have heard about Rhymes but not about languages. Thanks for such a useful article post. Any time you can get kids to chant/sing stuff to themselves outside of class, you’re doing well! Music is a powerful memory trigger, making it one of the best learning tools there is. You can listen to songs written in the language you are learning, but you can also make up your own! The post is quite interesting .. Yes I agree with your words. After reading this blog I can say that songs can help children learn and develop in a variety of ways, and as such it is something that should be encouraged in the education system. Also Primary school is a key stage of a child’s development and a time when a lot of their learning in a formative way takes place, which can have a big effect on them in later life. Thanks a lot for sharing your great ideas..
Music is with no doubt a great tool for learning languages! I agree that music is powerful and should be used as often as possible for learning or improving languages. As a educator I believe that music should be part of every curriculum in all educational systems. I always use this tip for my children everyday is “Sing together in the car”. Make a routine out of a specific car ride: going to school, coming back from school, going to the park, getting groceries, etc. We can listen to our favorite songs in the target language during one of the car rides as well. This is why Elena and Pablo know the lyrics of “Les Champs Elysees”. I love using music in my class with my ELL students. I used to teach the names of colors and sight words. They love it! site; couldn’t make it without ya! As much as you beat around the bush trying to make the experience acceptable to your child, to learn music ultimately come down to no end of practice. The way expert teachers see it, you need to get your child to start practicing no more than 10 minutes at a time, no more than twice a day in the beginning.